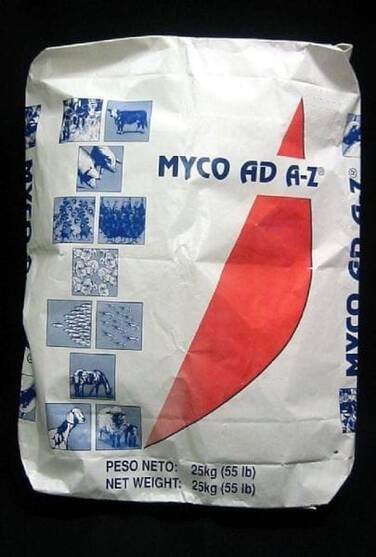 MYCO-AD A-Z is the new generation of mycotoxin binders that involves a special process, in which the clay is purified by extracting all the non-clay fractions that interfere with the adsorption of mycotoxins. This creates more points where the electrical charges of clay can coincide with the electrical charges of mycotoxins, increasing the NET adsorption of bipolar mycotoxins, and difficult to capture toxins, such as zearalenone. Once the non-essential fractions of the clay are eliminated, its individual layers are more exposed, presenting a larger surface for the adsorption and offering more angles where the electric charges of the clay can coincide with the electric charges of the mycotoxin. This process allows MYCO- AD A-Z to maintain the adsorption of polar mycotoxin and increases the adsorption capacity of the bipolar mycotoxin and of those toxins structurally difficult to capture, such as zearalenone. As is, for example, MYCO-AD regular can only adsorb 42 of the zearalenone at a level of 5000 ppb. Yet, when the clay has been submitted to the purification process, the adsorption capacity increases to 94 at 5000 ppb. In addition to increasing the adsorption, it also increase the efficiency of its adsorbent power, since instead of using 2.5 kilos of non-purified clay, it would only use 500 grams to capture 100 of 500 ppb of zearalenone. This same effect that MYCO-AD A-Z has with zearalenone is also applicable to other toxins produced by fusarium molds, such as fumonisina and trichothecenes. Moreover, there is an increase in the percentage of adsorption of mycotoxins that are not produced by fusarium, such as the ochratoxins. MYCO-AD A-Z does not adsorb nutrients, since it is a non-expandable clay and in addition, it has electrical charges more exposed to the surface, which makes it react with bipolar substances of high reactivity, such as mycotoxins. Although several of the nutrients present bipolar electric charges, this molecules have a very low reactivity in comparison to the mycotoxin, making it very difficult to be adsorb by MYCO-AD A-Z. The mechanism of action is adsorption and is irreversible, once the mycotoxins are adsorbed by the clay, they are excreted through the feces. MYCO-AD A-Z does not depend on any factors that are found in the GI track that can influence its effectiveness such as, antibiotics, enzymes, bacteria, etc. ; and does not bio-transform mycotoxins in a metabolite that could be as toxic as the original mycotoxin. MYCO-AD AZ does not adsorb nutrients because it is a non-expandable clay.